I was quite pleased that only a bit more than a week before he resigned i named February of 2011 “Mubarak Falls“. Now i have been itching to name March. There are several countries in the region where the dictatorships are in danger. Peaceful protests were held in Morocco this weekend. Despite pledges not to cut subsidies and to permit local elections and minimally expanded press freedoms, Syrian opposition forces had a “Day of Rage” protest, where protests are banned. In Palistine, protesters are demanding that Hamas and Fatah heal their riffs (quite different from the rest of the region actually). January’s protests in Sudan have been followed by smaller protests in this country which bans them. In oil rich Kuwait protests focused on the rights of guest worker, rather than the overthrow of the corrupt monarchy the US reinstalled 1990. In Algeria, 30,000 riot police were unable to stop protesters demanding the end to their corrupt dictators reign. And revolution is no guarantee of happiness or peace. Tunisia‘s interim PM just stepped down because “I am resigning today because I am not willing to be a person that takes decisions that could cause casualties.” And protests continue in Egypt for the release of political prisoners, the end of state of emergency restrictions and a civilian government. 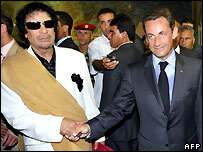 But the focus of the western world medias and governments is on Libya and it’s charismatic oligarch Muammar el-Qaffafi. Africa’s longest reigning non-royal leader has had some curious supporters over the years, including John McCain after Libya suspended is weapons of mass destruction program in 2004. The London School of Economics was embarrassed this week by it’s support of Qaddafi’s son who it gave a PhD to. British PM Tony Blair praised Qaddafi in 2004 for his efforts to fight “the War on Terrorism” against religious extremists. Condoleezza Rice when she was in power was interested in expanding US oil business activities in the area and French President Sarkozy was quick to make deals with Qaddafi for reactors once sanctions were lifted. The western press has been famously unreliable in covering Tripoli and now it is claiming half the country is outside of Qaddafi’s control and oil facilities are in the hands of the opposition. US warships are head to the coast, even as the local opposition requests we stay away and they can do it without our assistance. But even when it is wrong, the media influences the world and my guess for March of 2011 is that Qaddafi Falls and that is what i am going to call it. @Jbird Oh but Qaddafi is a hero to many in the region. Sadly, my radical friends who appreciate him did not get their writing on him to me in time for this post. But especially early in his career Qaddafi was one of the very few African leaders who stood up to US bullying in the region and actually challenged US dominance of the region. At of course quite some cost. While not a fan of terrorist tactics or dictators, unlike the wikipedia article on him and most of the western press perspective, i completely understand why he took many of the actions he did. We can not like him and get why he is charismatic.